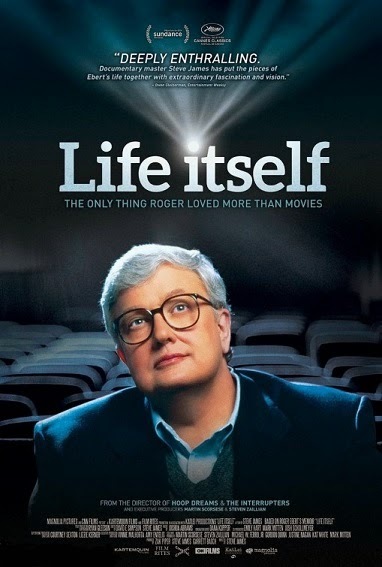 Tag line: "The only thing Roger loved more than movies"
It was an overcast day in April of 2013 when I first learned of Roger Ebert’s passing. I was on break at work, and headed out to my car to check my cell phone (unlike most people, I don’t have a smart phone, so I don’t feel the need to have it on me at all times). It was then that I saw the text message from my friend John: the film critic who had changed my life was dead. One of the unwritten rules I laid down for myself when I started this 2,500 movie challenge of mine was that I would avoid referencing current events, which, as everyone knows, don't stay “current” for very long. It was my hope that, in doing so, my reviews would remain “timeless”, meaning people would read them and have no idea when they were written (the glowing praise I heaped on Local Hero five years ago could have just as easily been penned this morning). On April 6, 2013, I temporarily tossed that rule out the window. To ignore the demise of one of the all-time great film critics was unthinkable to me, so I reviewed 1984’s Angel (to understand why I chose this movie, you’ll have to click the link) and in so doing said goodbye to a man who’d turned me on to some of the best motion pictures ever produced. That was my tribute, meager though it may be. The 2014 documentary Life Itself serves as director Steve James’ homage to this exceptional man. Narrated at times by Ebert impersonator Stephen Stanton, the movie covers every aspect of Roger Ebert’s life, from what was common knowledge (his often-turbulent partnership with Gene Siskel and their hugely popular television show; his career with the Chicago Sun-Times; the screenplay he wrote for Russ Meyer’s Beyond the Valley of the Dolls; and his drawn-out battle against cancer) to those things very few people knew about him (his childhood in Urbana, Illinois; the time he spent as editor of his college newspaper; his bout with alcoholism; and his loving relationship with his wife Chaz and their grandchildren). In addition to presenting his past, James and his camera were at Ebert’s side right up to the end, when, surrounded by those who loved him, he realized he could fight no longer. Featuring interviews with some of the cinema’s true visionaries (Martin Scorsese, Errol Morris, Werner Herzog) as well as its up-and-coming stars (at one point, Ramin Bahrani, director of 2005’s Man Push Cart, receives a gift from Ebert that immediately makes him the envy of every film fan on earth), the movie also utilizes archival footage to paint as complete a picture of its subject as possible, up to and including candid images of his final days. More than a documentary, Life Itself is joy and heartbreak wrapped up in a very engaging two-hour package, and I, for one, am glad it was made.